October 15, 2002 - 8:30 p.m.
A woman sits next to the door, smoking and flicking her cigarette ash directly onto the tiled floor. Now she's moved over closer to me for some reason and is looking at the horse-racing section of a newspaper. Then she gets up and moves around the corner, out of sight. There's a Roller Coaster Tycoon pinball game here, one I haven't seen before. On the side of the machine, a yellow spiky circle (to convey extra excitement) says, "Based on the top-selling PC-CD game." A guy was playing earlier, and his face lit up several times during the game from the bright flashing lights he managed to trigger. I'll bet the PC-CD version doesn't have bright flashing lights. Give me pinball any day. I got two orange tubes of powdered sugar with my espresso; they are customized for this café, featuring the name of the place superimposed over repeated alternating white silhouettes of someone kicking a ball and someone riding a bike. The waiter is Asian and reprimanded me for trying to unload ten copper pieces on him in an effort to give him exact change. So I kept the pennies and he gave me change for two Euros. I probably made a friend by not forcing all those tiny coins on him. The woman keeps coming back and sitting down and then getting up again every few seconds to go look at the races on the TV monitors. It's making me a bit nervous. That and the little purple-shirted Asian boy running in and out, always on the verge of falling down. 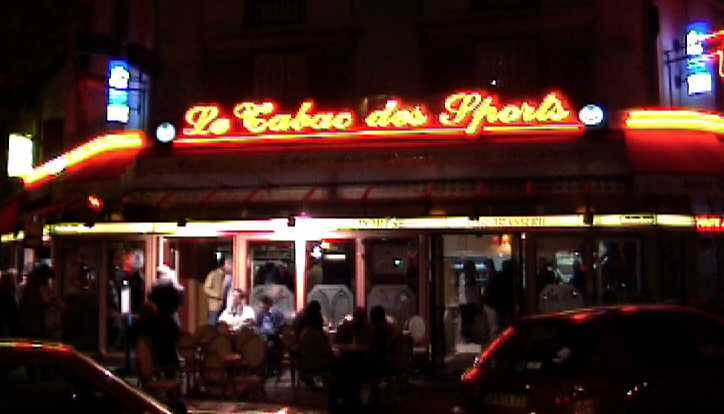 But the place is truly alive with people at the bar, sitting at tables inside and out, getting fresh crêpes from the woman on the other side of the windows behind me, or standing at the race monitors. Everywhere there is talk, bubbling with excitement, the sound of people in good spirits. The woman is making excuses to the Asian waiter. She says she doesn't want to order anything and is just sitting down temporarily because she is tired. He gives me a look like, who is this woman? We both communally shrug, so imperceptibly that maybe it's only in our faces, not visible to anyone else, but we see it and it seals our friendship. Too bad I'll probably never see him again.